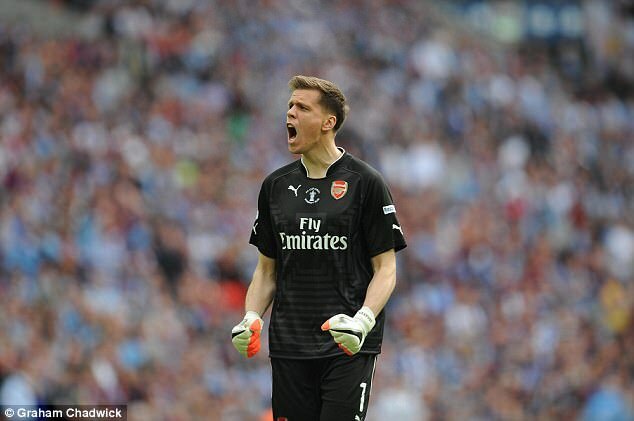 Arsenal goalkeeper Wojciech Szczesny is close to agreeing a £14million move to Italian champions Juventus. The Poland international has excelled on loan from Arsenal at Roma where he kept 14 clean sheets last season prompting offers from Napoli, AC Milan and Inter. However, the 27-year-old is prepared to move to Turin now where he will be primed to take over from veteran Gianluigi Buffon. Szczesny has one year left at Arsenal yet, despite talk of a pre-contract agreement for January, he is prepared to make the move to Italy now. The goalkeeper’s agent told Polish media the goalkeeper will speak with Arsene Wenger before finalising agreement with Juventus. Arsenal also expects to lose David Ospina to Turkish side Fenerbahce for around £4m. ‘There is still no agreement with Juventus,’ David Manasseh said to Przeglad Sportowy. Wenger is expected to be supported by an improved transfer budget this summer and apart from a goalkeeper will also look to add a centre-back as Per Mertesacker looks to retire. The Gunners have also been linked with a move for Kylian Mbappe while Wenger retains an interest in Lyon striker Alexandre Lacazette.